Maine’s hospital obligation and the school-grading system dominate the menu for a breakfast discussion. PORTLAND — Gov. 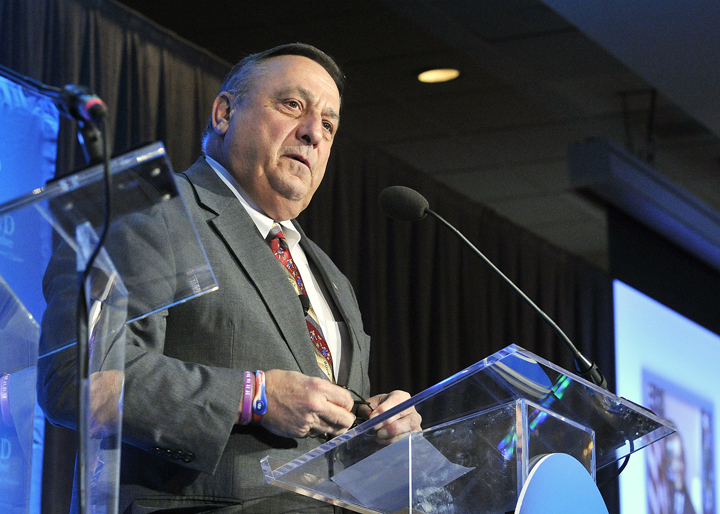 Paul LePage covered topics including Maine’s new school-grading system, the state’s multimillion-dollar debt to its hospitals and his likely re-election bid in a speech Wednesday to about 350 people from Greater Portland’s business community. He also spoke about Maine’s economic challenges, including an “$850 million hole” in the proposed state budget for the next two years. LePage, the featured speaker at the Portland Regional Chamber’s Eggs & Issues breakfast event, defended the Department of Education’s A-to-F system for grading public schools’ performance, which was introduced last week. Critics say the system, based largely on math and English standardized test scores, is overly simplistic and doesn’t accurately reflect the quality of some schools. Democrats in the Legislature proposed an alternative system Wednesday, saying it would take more factors into account to gauge individual schools’ performance. LePage said he expected initial criticism for adopting the letter-grade system, but said it has been effective in other states. The governor went on to discuss the controversy over the state’s debt of roughly $186 million to its 39 hospitals for Medicare reimbursements. LePage wants to use revenue from the state’s next wholesale liquor contract to pay off the debt, which would release an additional $298 million in federal money to the hospitals. The Democrats, who have majorities in the House and Senate, want to make the payment of hospital debt contingent on expanding Medicaid coverage in Maine. LePage opposes making that connection. He said the expansion is unnecessary because the federal Affordable Care Act’s health-insurance exchanges will provide cheaper coverage options when they open Jan. 1. “As soon as the exchanges are put up, we’ll be able to provide them insurance,” LePage said. House Speaker Mark Eves, D-North Berwick, later took issue with LePage’s comments, saying Maine’s hospital debt is symptomatic of a larger problem: high health-care costs. LePage spoke briefly about the proposed state budget for the two years that start July 1, alluding to an ongoing debate over how to make up a shortfall. LePage fielded questions submitted in advance by audience members, starting with the question of whether he plans to run for re-election. “The likelihood is I probably will run again,” he said.